From one of the most admired international leaders, comes a timely, considered, and personal look at the history and current resurgence of fascism today and the virulent threat it poses to international freedom, prosperity, and peace. At the end of the 1980s, when the Cold War ended, many, including former Secretary of State Madeleine Albright, believed that democracy had triumphed politically once and for all. Yet nearly thirty years later, the direction of history no longer seems certain. A repressive and destructive force has begun to re-emerge on the global stage--sweeping across Europe, parts of Asia, and the United States--that to Albright, looks very much like fascism. 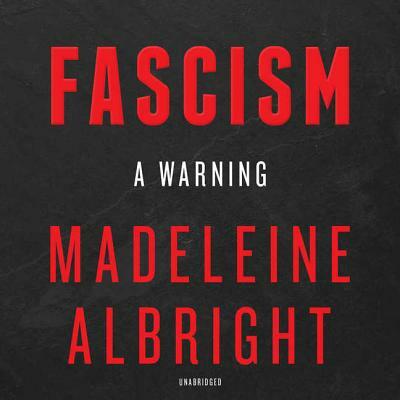 Based on her personal experience growing up in Hungary under Hitler and the Communist regime that followed World War II, as well as knowledge gleaned from her distinguished diplomatic career and insights from colleagues around the globe, Albright paints a clear picture of how fascism flourishes and explains why it is once again taking hold worldwide, identifying the factors contributing to its rise. Most importantly, she makes clear what could happen if we fail to act against rising fascist forces today and in the near future, including the potential for economic catastrophe, a lasting spike in terrorist activity, increased sectarian violence, a rash of large-scale humanitarian emergencies, massive human rights violations, a breakdown in multilateral cooperation, and nearly irreparable self-inflicted damage to America's reputation and capacity to lead. Albright also offers clear solutions, including adjusting to the ubiquity of social media and the changing nature of the workplace, and understanding ordinary citizens' universal desire for sources of constancy and morality in their lives. She contends that we must stimulate economic growth and narrow the gap between the rich and poor, urban and rural, women and men, and skilled and unskilled; work across borders to respond to transnational challenges; and ultimately recognize that democracy's unique virtue is its ability--through reason and open debate--to find remedies for its own shortcomings.